Halloween is right around the corner and, as has been typical for Kyle Busch the No. 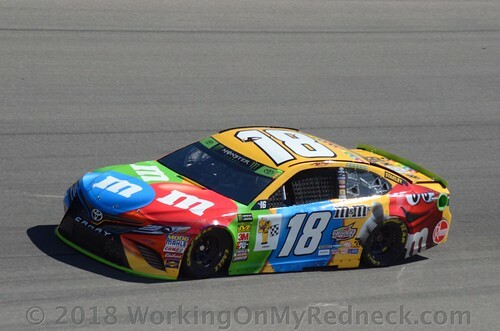 18 M&M’S Toyota for Joe Gibbs Racing (JGR), the colorful candymaker will yet again go racing with a special Halloween scheme Sunday afternoon at Martinsville (Va.) Speedway to celebrate M&M’S Halloween fun packs leading into the big day next week. Along with his favorite chocolate candies, Busch is looking for something else to add to his Halloween treat bag following Sunday’s First Data 500 at Martinsville, and that’s the traditional Martinsville clock trophy for winning at NASCAR’s shortest track. While the clock may be way too big for his treat bag, a win would be quite the treat as it would automatically qualify him for the season-ending Championship 4 at Homestead-Miami Speedway three weeks hence. Busch knows the feeling well as he won at Martinsville last October, sending him to the Homestead finale and allowing him and his team to focus on the last race of the season a few weeks early. The spooky-looking M&M’S scheme will race three days before Halloween at a place that used to challenge Busch earlier in his career and early on in his 11-year tenure with JGR. Busch finished outside the top-10 in three of his first four Martinsville races with JGR in 2008 and 2009. By contrast, Busch has scored eight top-five finishes in his last 11 starts there, with a worst finish of 15th. The beginning of the recent success at Martinsville for Busch and the M&M’s team is the 2015 NASCAR Cup Series champion’s first career win at the paperclip-shaped oval in April 2016. Not only did he bring home his first Martinsville clock, but he also did it in dominating fashion, leading five times for a race-high 352 laps en route to victory lane, along with the win last October where he took the lead late. With just four races left in the season, and with the series kicking off the Round of 8 of the 2018 playoffs at Martinsville this weekend, Busch knows a repeat performance from last October could go a long way in his efforts to bring home his second Cup Series championship for the M&M’S team. All season long, Busch and his M&M’S Halloween team have not been ones to back down from a challenge. 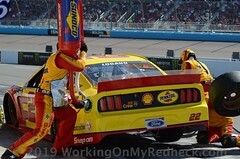 He was able to cruise through the first two playoff rounds, most recently with a solid runner-up finish in Sunday’s Round of 12 elimination race at Kansas Speedway in Kansas City. Now that he’s made it to the final eight, Busch feels he has just as good a shot as anyone to win his second Cup Series title. So as the season heads into the homestretch, Busch and the M&M’S Halloween team know that, when it comes to being championship-eligible at Homestead, they’ll hope to take advantage of the confidence built during the last several years at Martinsville. Since he already conquered the .526-mile short track in Southern Virginia just last year, Busch hopes in addition to an M&M’S treat and the traditional Grandfather clock to add to his treat bag, a punched ticket to the championship race in Homestead will be waiting for him at the end of Sunday’s 500-lap race, as well. How do you feel about the race this week at Martinsville? How do you feel about the Round of 8 of the playoffs at Martinsville, Texas and Phoenix? 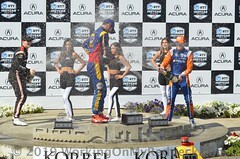 What is the key to you getting a win at Martinsville? Your racecar is sporting the special M&M’s Halloween paint scheme this week. What was your favorite Halloween costume that you wore as a kid? Growing up in Las Vegas, what do you remember about Halloween and trick-or-treating? The First Data 500 will mark Kyle Busch’s 495th career Monster Energy NASCAR Cup Series start and his 27th NASCAR Cup Series start at Martinsville (Va.) Speedway. Busch has career totals of 50 wins, 30 poles, 180 top-five finishes, 266 top-10s and 15,612 laps led in 494 career Cup Series races. His most recent Cup Series win came last month at Richmond (Va.) Raceway. Busch’s most recent pole, the 30th of his career, came on the 1.5-mile oval at Charlotte (N.C.) Motor Speedway in May. Busch has two wins, 14 top-five finishes and 15 top-10s and has led a total of 1,324 laps in 26 career Cup Series starts at Martinsville. Busch’s average Martinsville finish is 12.7. Martinsville Momentum: Busch as an average finish of 2.2, an average of 167.4 laps led, and 68.8 fastest laps over the last five races at Martinsville. Three-Peat: Busch’s consecutive wins at Texas Motor Speedway in Fort Worth, Bristol (Tenn.) Motor Speedway and Richmond in April marked only the 25th time in NASCAR’s modern era (1972 to present) that a driver won three consecutive races. 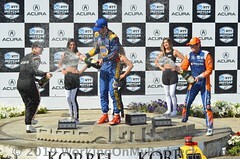 Nine of the 23 previous times a driver won three consecutive races in a season, that driver has gone on to win the championship. 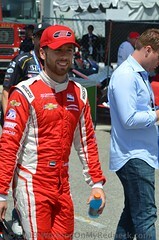 Before 2018, Busch was the most recent driver to win three in a row – in 2015, when he went on to score his first and, so far, only championship. Fellow championship contender Kevin Harvick accomplished the feat earlier this season prior to Busch’s hot streak in late spring. 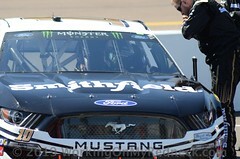 Brad Keselowski joined the group with wins at the recent events Darlington (S.C.) Raceway, Indianapolis Motor Speedway and Las Vegas Motor Speedway. This marks the first time in NASCAR history that three different drivers have won three consecutive races in the same season. 193 and Counting: Busch enters Martinsville with 193 career wins among NASCAR’s top three divisions – Cup (50), Xfinity (92) and Truck (51) – following his Cup Series win last month at Richmond.